I was in Tangier, having somewhat of an ambivalent attitude towards Morocco after my horrible experience in Fes. But Tangier was not the one to blame for my lack of interest. I was just not in the mood. I was still “mourning” the loss of my iPhone, recovering from my wound and bruises, and being overly cautious at every corner I took. I was near the end of my time in Morocco. 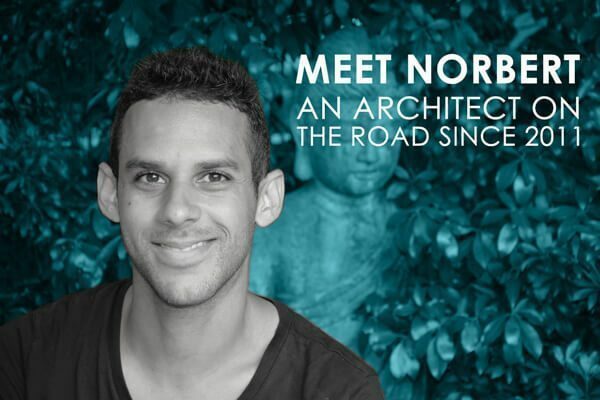 I struggled between plopping dead in my hotel room to count the days pass by until I left the country, or revive my adventurous spirit and keep doing what I like to do. The latter won, mostly because I had one last town to visit: Chefchaouen. I had heard so many good stories about the narrow blue houses and the peaceful labyrinth-like medina of Chefchaouen that it would have been a shame to leave Morocco without visiting it. I walked to the bus station in Tangier and took the CTM bus to Chefchaouen. The ride was uneventful, but as I approached my destination, I could see how the landscape slowly transformed itself from plains and valleys into a vast, green mountainous region. I was in the Rif Mountains. 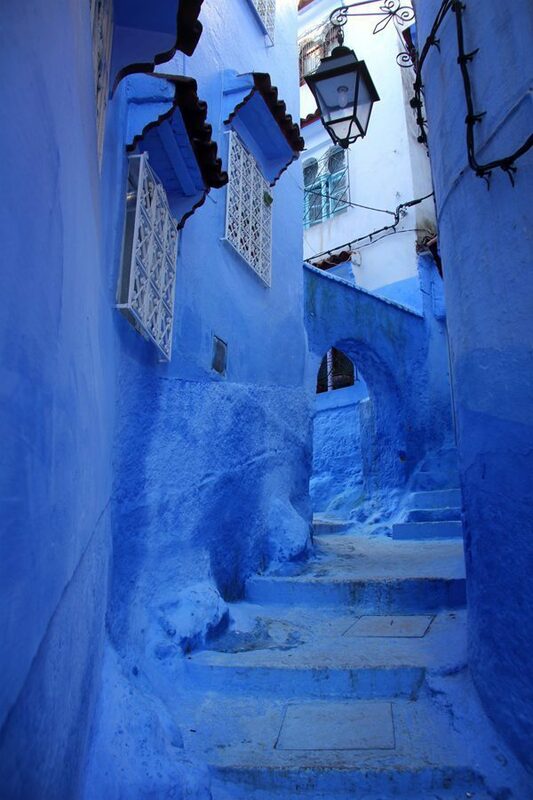 Chefchaouen is a town in northwest Morocco famous for its medina – painted in many shades of the blue gradient. The medina was so peaceful and relaxing, and when combined with the heavenly blue environment, I couldn’t help but fall in love with it. This was what I just needed. Every single corner presented a new scene; and while many of them were quotidian scenes, seeing them in hundreds of shades of blue made them very unique and visually overwhelming. The arrangement of the medina is just as chaotic as any other medina in Morocco. Should you not know where you’re going, every new turn will be a new opportunity to get lost. 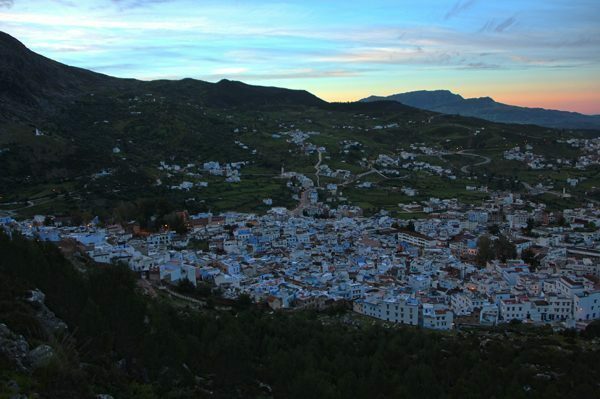 But in Chefchaouen, getting lost is actually an enjoyable act of discovery. Which unconventional blue scene will I see after the next corner? Not only getting lost in the medina was a way to discover new spaces, but also a way for me to regain my sense of place. In my attempt to understand the ups and downs of the past few days, I had temporarily lost my sense of place. What happened to the Morocco I was enjoying so much? 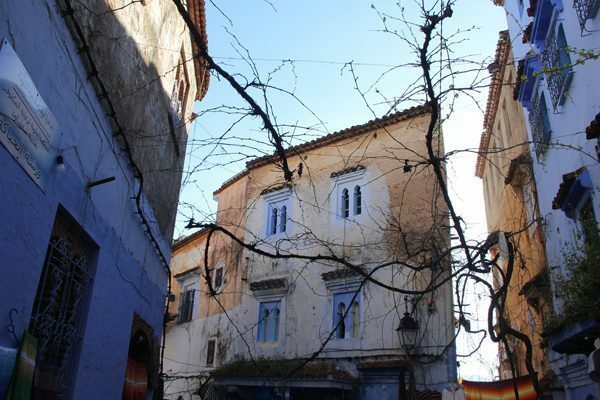 Getting lost in Chefchaouen is a wonderful thing in itself. For me, it was an enjoyable scavenger hunt. I picked up a small piece of my senses and my desire to see more of the city and Morocco at every single aimless turn. You think you might be heading somewhere in specific, but you end up in the opposite corner with just as many beautiful details and scenes to be discovered. Every corner held a wondrous surprise of color and texture. I loved the unique textures created by the hundreds of layers of paint plastered over the floors, walls, and ceilings over the past 500 years, and how the sun hit them in a way that created waves of light and shadow along the surfaces. But this is not just a monochromatic town. The blue surfaces are well contrasted by the manicured green plants, the un-plastered brown rocks, the pale white walls, and the colorful clothes hanging, waiting to dry with the sun. The narrow alleys echoed the laughter of children playing ball and running their toy cars down the gentle slopes. The sound of water reverberated through the space as if fell in the basin of the fountains; only interrupted by the fluid mix of Arabic, French, and Spanish spoken by locals going about their lives. It was an overwhelming experience, but it was a welcomed wake-up slap to my senses. After a few hours of walking in the medina I headed to a restaurant in front of the Kasbah. 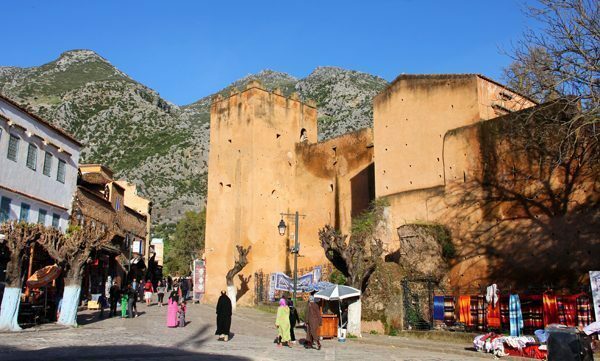 The city was actually founded in 1471 with the construction of this Kasbak (or small fortress) to fight the Portuguese invasions of Northern Morocco. It is quite a contrasting structure, in comparison to the amalgam of blue shades that surrounds it. During my meal, a kid of probably 8 years old came to my table. He saw my coke and asked if I could share it with him. At first I looked at him with a clueless expression. I was still coming out of my “don’t look, don’t touch, don’t talk to me” phase I embraced for the past few days after Fes. It took me a while to actually respond to him. Probably just as clueless to my lack of reaction, the boy tried again in Spanish. This time I reacted. I took a cup and served him some coke. He rapidly drank it with much enjoyment. He was hungry too, so I shared the rest of my fries with him and watched as he picked them one by one and chewed them with a smile on his face. He repeatedly thanked me in Spanish as he ate, very grateful for the quasi-meal he was having. As he stood there, we had a very narrow conversation and after a few minutes, I said goodbye by handling him another glass of coke. I was happy. Chefchaouen made me happy. I finished my day by hiking up the hill of the Hotel Atlas to watch the sunset. There, I watched how the peaceful medina turned from blue, to shades of light orange, to a dark mass. 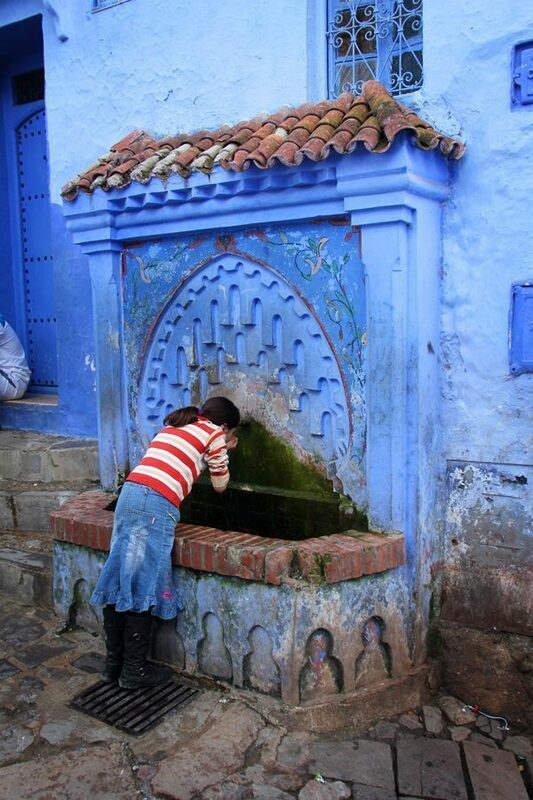 Chefchaouen made me want to stay more time in Morocco. Chefchaouen deserved more of my time. Love all the blue! What a lovely place! Glad this trip helped you get over what happened in Fes. The town view is incredible!! 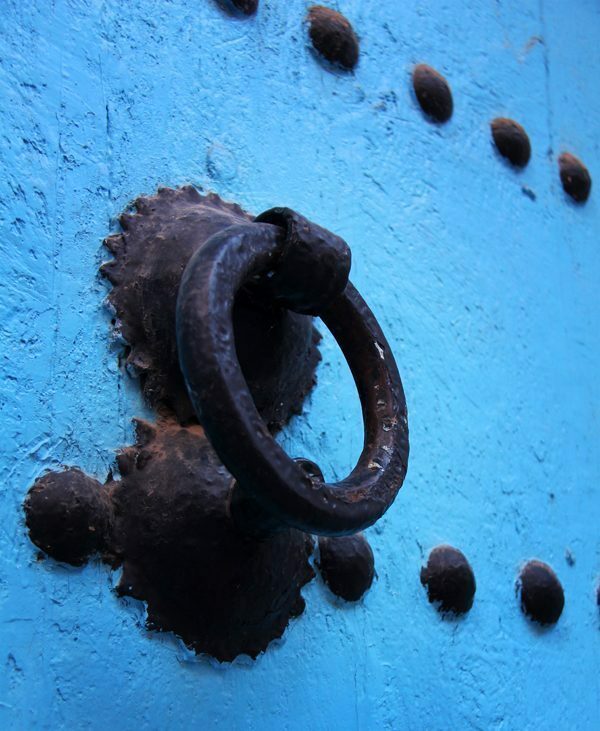 Oh, I love the blue shades in Chefchaouen! 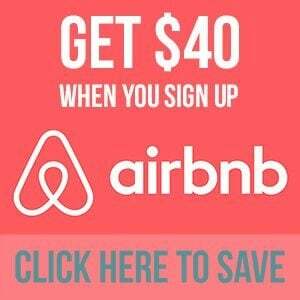 I truly recommend you to go there! This was one of the first places we went to in Morocco! We were completely sold when they told us the whole village is painted blue! So magical when the rain trickles down the stairs…Did you enjoy the coach journey up the mountain (not sure if it is, but it seemed pretty high up!)? haha! That’s the same way I was sold on it… the whole village is blue! Blue?! I want to see that! I did enjoy the coach ride up the mountain! It’s beautiful! I love this city when I was in Morocco this January! 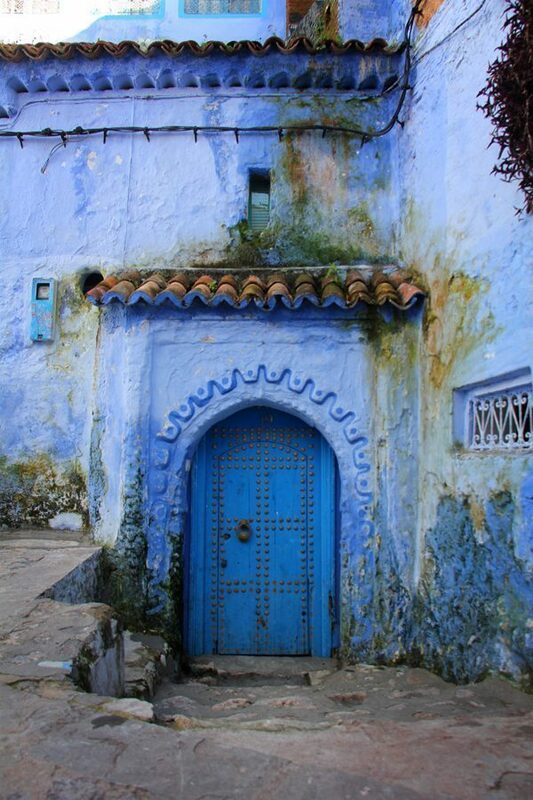 Chefchaouen is one of my top 3 cities in Morocco. Totally worth visiting it! Seems like I have two Blue cities on my bucket list now! But judging by these pictures, this one is way more beautiful (not to mention peaceful) than Jodhpur. So happy to have come across this post, thanks for sharing! I didn’t have the chance to visit Jodhpur when I went to India, but I dare to say that Chefchaouen might be more peaceful! I guess I have to add Jodhpur to my list now! 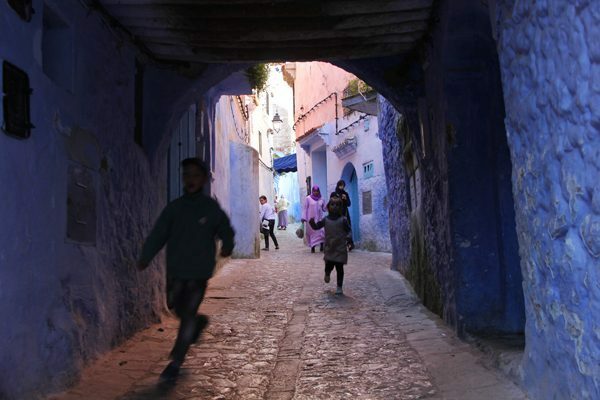 I was in Chefchaouen last year – and I don’t recall being in another place that felt so whimsical. Great read and pictures – thank you!